About a week ago we had Benjamin Franklin Plumbing come out to fix whatever was causing our basement plumbing to back up. We assumed it was clogged like it did shortly after we moved in 5 years ago. They told us that the reason was that they found with a camera, a “broken, caved in pipe under the floor that was filling with mud” so it was clogged with mud, hence the back ups. 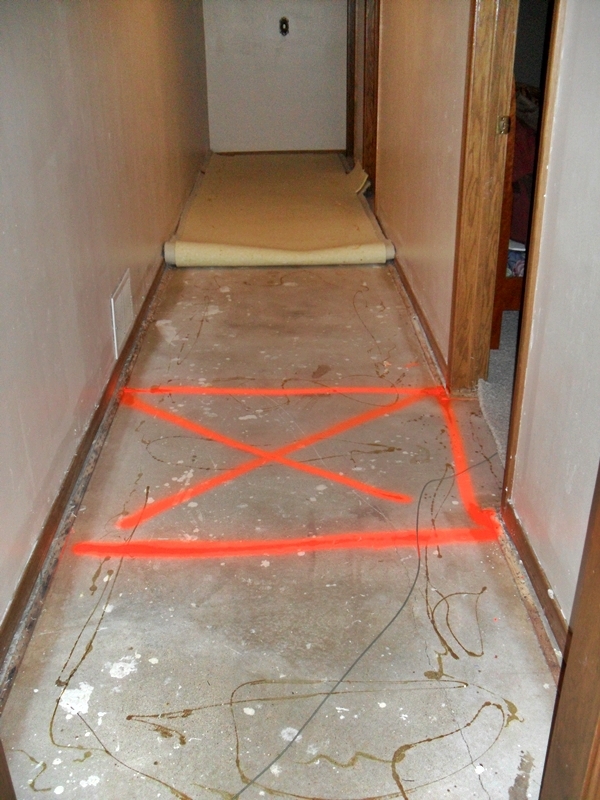 So they pin pointed the exact spot of the “broken” pipe, had the new carpet pulled up, cement guys came in to cut out the floor so they could replace the “broken” pipe. 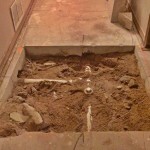 So after they cut out the floor, come to find out the pipe was never broken. Not cracked, nothing. Just very clogged. Ant not with mud, but with a white putty-like stuff that they said they’d never seen before. 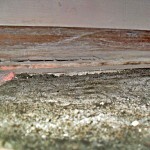 But after talking with other plumbers, it’s common with basement pipe with laundry soap and whatnot. We went downstairs to have a look at the “progress” while the plumbers were outside and even saw the pipe for ourselves, unbroken. It had cuts in it from when the cement guys cut out the floor, but not breaks or cracks or nothing; a perfectly fine, clogged pipe. 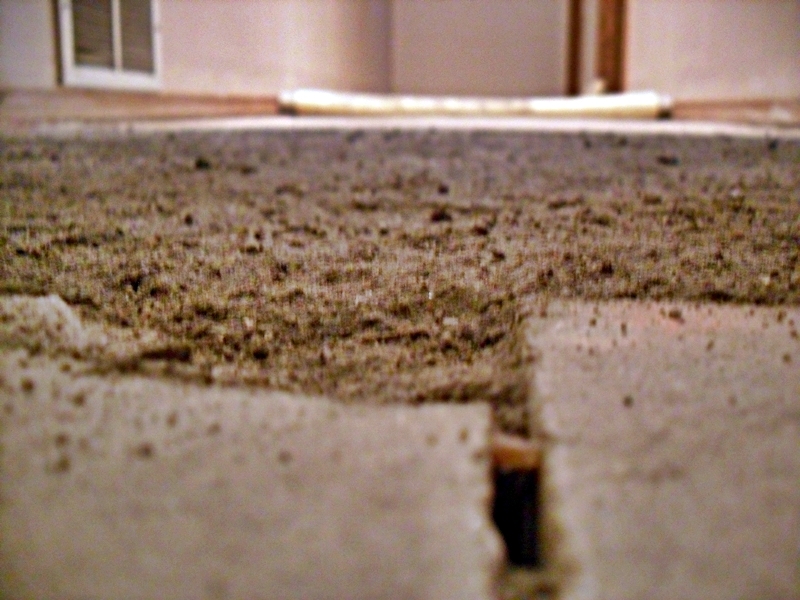 After they came back in the said they thought they clog may be clogged worse further down the line and suggested that they might need to tear up the entire hallway and replace the whole line. Of course we didn’t want to do this so we just had them try to pressure jet it out first.We also brought up the fact that we did not see anything wrong with the “broken pipe” They tried to turn it around and say that our definitions of “break” were different and that they just meant that the joints were just loose and stuff was seeping in. 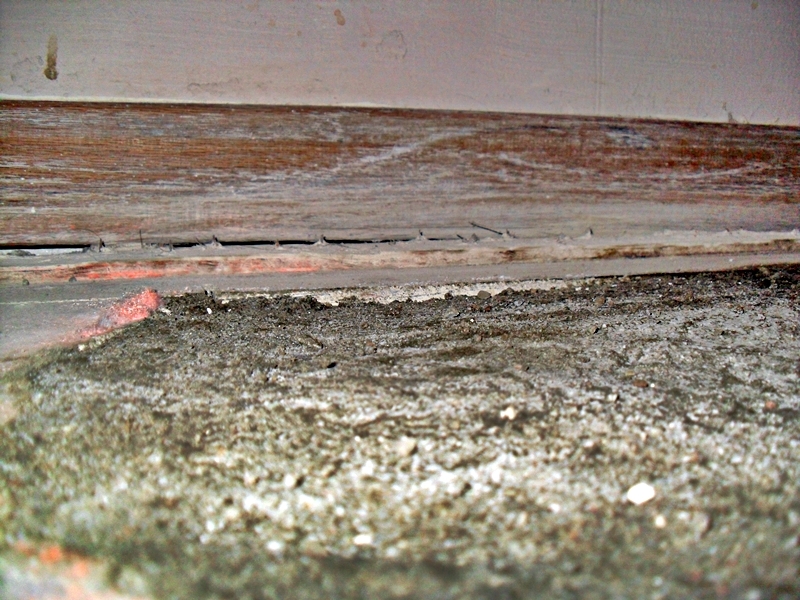 But I was told it was broken and caved in and filled with mud, and not to used the sinks because everything that drained was making it muddy under the house and would cause the cement slab to sink. There was no mud, there isn’t even dirt under the house..it’s all sand. So the pressure jetted out the pipes to clear all the stuff out. Success. That was all that ever needed to be done. 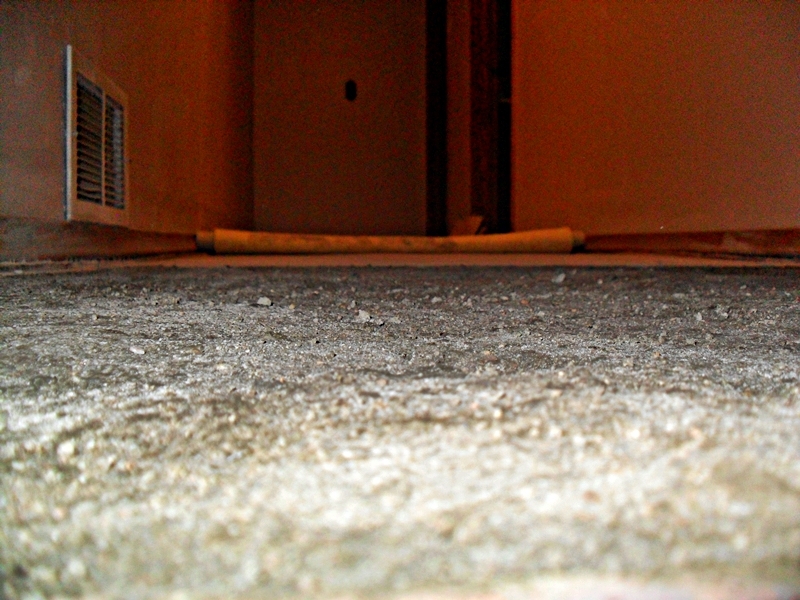 We never needed to have our carpet pulled up, the floor removed and a perfectly fine pipe replaced. Chad let them know we did not want to pay for having all that unnecessary work done. After hearing that they called their boss to see if they should even finish doing the work. 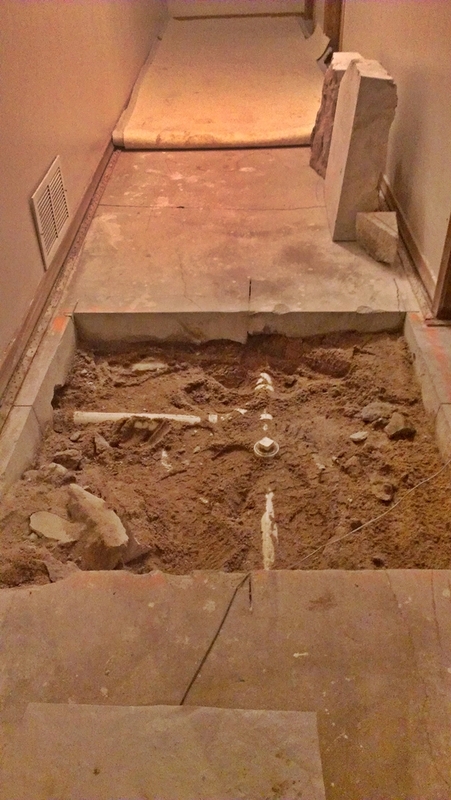 (filling in the hole) Their boss said to go ahead and finish and that he would call and talk to Chad. Chad had to go back to work, but made it clear to them that I would not be signing anything or paying anything, at least not until he spoke with their boss to get things straightened out. After they finished filling in the hole and were ready to leave, came up and told me they were done and that “Your husband said you would pay with card.” Knowing this was not true because I had talked to Chad about it before he left, called Chad at work. Chad had the card that we would have used if we were going to pay so I told them he had the credit card. 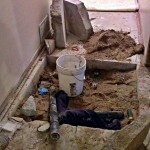 One of the plumbers then rudely replied, “So, then we’re just not going to get paid? !” So I put Chad on the phone with him. Chad told them their boss still had not called to talk to him. They said that their boss said he called and left messages. But there were no missed calls or messages. So they left without us paying like we had planned on in the first place. Chad is supposed to talk to their boss again today to get this cleared up. They also have a 100% satisfaction guarantee on the back to every invoice that says if you’re not 100% satisfied with the work done they’ll refund all your money. Well. We are not satisfied. 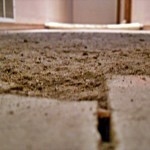 So far they have not been compliant and we may end up going to small claims. On top of all that, I went down to see the “finished” work. The cement job they did is horrible. 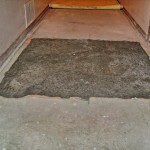 It very rough and scratchy and without a down will tear up the carpet pad and whatever else. 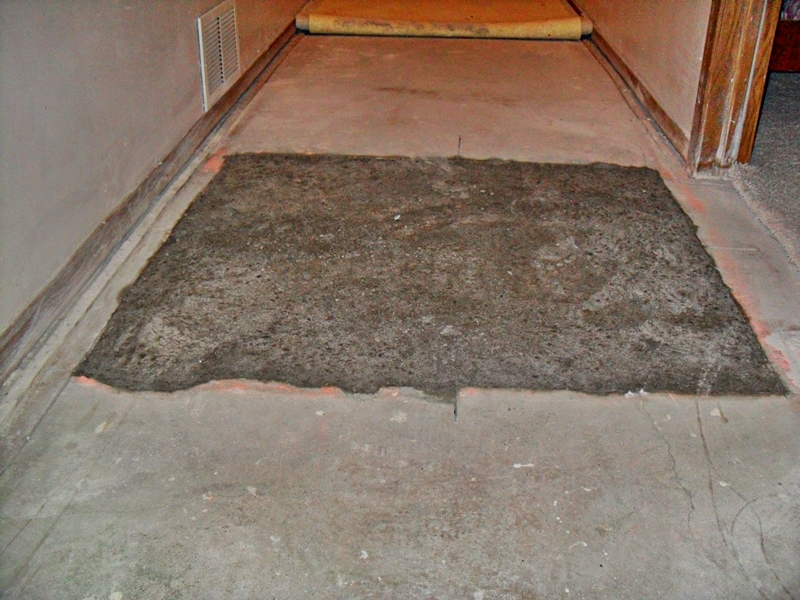 It’s not flat or even, it’s extremely lumpy and bumpy and parts don’t even come up all the way to fill up the space.There are still huge cuts in the floor that I thought would have gotten filled. 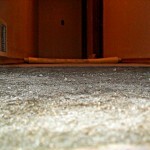 It’s horrible cement, NOT what basement floors are made of. Sidewalks are nicer that this. I had expected to have the same kind of cement that is already down there. This was supposed to be a one day job as I was told it was, but they cut it out, cleared the clog and put in a new pipe on Monday, left and were supposed to come back Tuesday to fill it in. They called Tuesday morning and said they couldn’t get a hold of the cement guys so they would come on Wednesday. 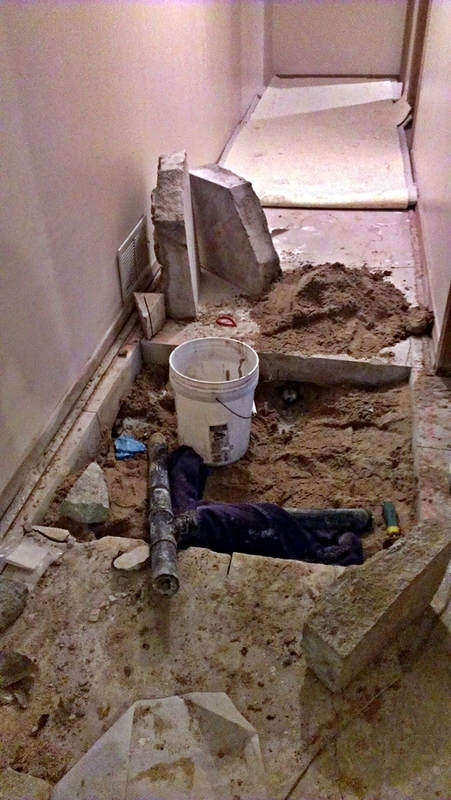 We were like, okay, and left with the impression that the cement guys would be coming to refill the hole. Wednesday the plumbers got showed up and turns out THEY are the ones who refill the cement. Not the cement guys. So they lied about that, and there was no reason they couldn’t have done it on Tuesday. This has been the worst experience ever. I had expected way more from one of Wichita’s biggest plumbing companies. They did nothing but lie to us and destroy our basement. 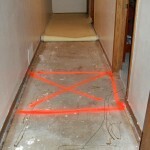 Today the plumbers came out and pulled back the carpet to mark the spots that need to be torn out. 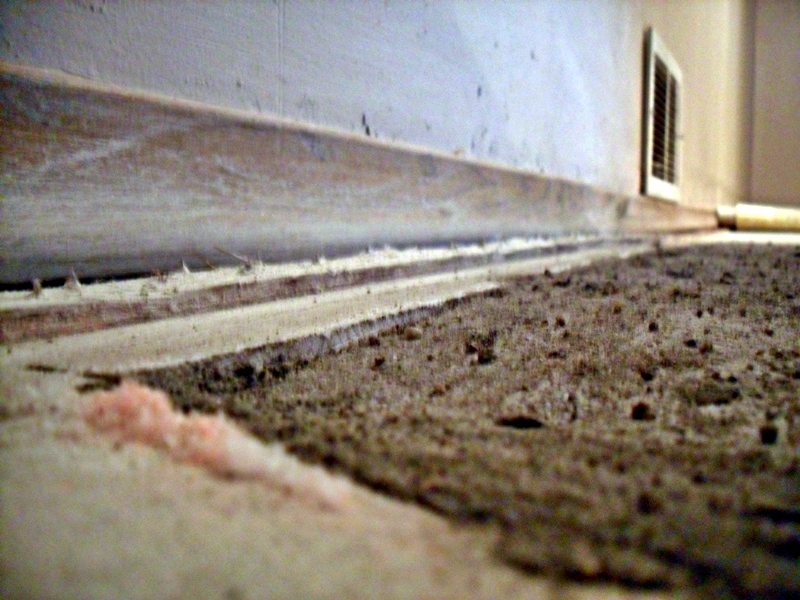 Lucky for us, one of the plumbers used to do carpet so he could pull is back for us instead of us having to hire someone. We still have to have someone else re-install it, but that’s alright. That saved us a little bit of time and money. Now we just have to wait to find out when the concrete digger people can come out. So hooray! Step one is complete! Well, as some of you know, we’ve been having some plumbing issues. We called the plumbers out yesterday thinking that we just needed to have the line cleaned out because it was clogged and every time we used the kitchen sink, dishwasher or washing machine it backed up and there was a mess. 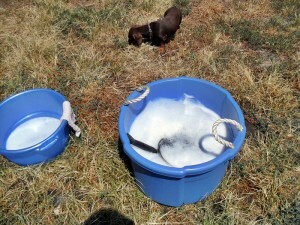 So they came out and the plan was that they would flush the line and use a camera to make sure they got it all out. But they couldn’t even get the thing through to clean out the pipes. The camera found out that there’s a broken pipe underneath the basement floor that is full of mud and everything else. 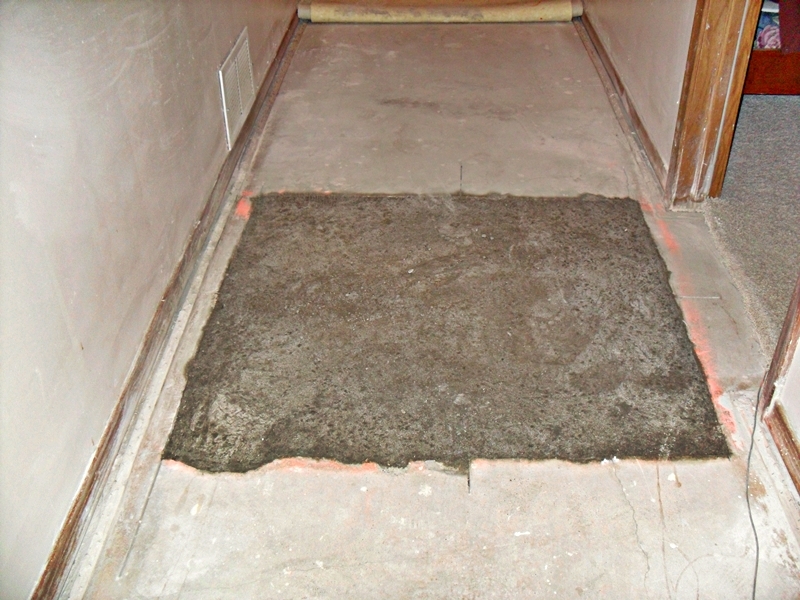 So we get to hire someone to tear up the new carpet that we just had put in not that long ago, have the cement floor destroyed, replace the broken pipe(and whatever else they find) pour new cement, and hire someone to re-install the carpet. So after spending $500 for them to tell us that and replace a small pipe behind the washer, we get to spend at least $2,200 more to have it fixed. Joy. 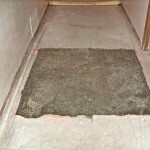 So until this can all be done, we can’t use the sink, dishwasher or washing machine or it will keep making more wet mud under the house(and a mess inside)and then the cement floor will start to sink. Ugh! And of course there is a ton of dishes in the sink and loads of laundry that need to be done. 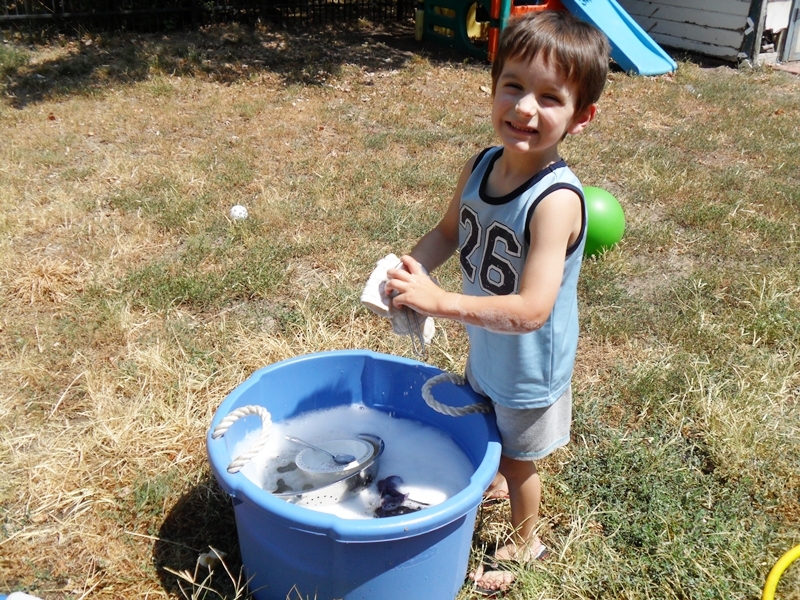 So this afternoon Kaden and I did dishes in the backyard like savages. At least he thought it was fun. From now on it’s paper plates and plastic forks. Maybe next I’ll take the laundry down to the river. 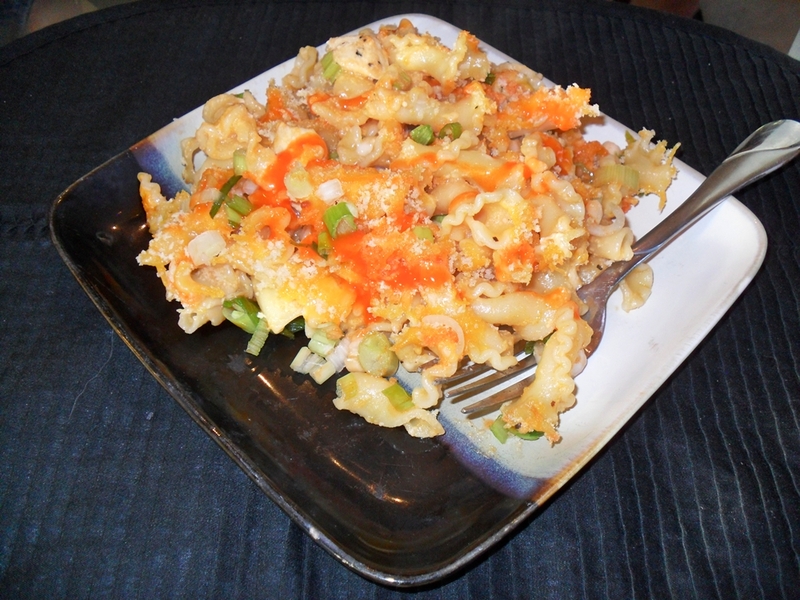 Last night I made Baked Buffalo Chicken Pasta. I was pretty yummy. But once again, made waaay more than the two of us could eat so we’ll be having leftovers for some time. But that’s alright. While pasta is cooking, heat a medium saucepan over medium heat. Add the butter, and once it’s melted and bubbly add the flour. Whisk together to create a roux and cook for 1-2 minutes. Add milk, stir and reduce heat to low. Stir until milk thickens. Add grated cheeses and continue to stir until mixture is smooth. Stir in buffalo sauce. Taste and season with salt and pepper. Spray a 9×13 baking dish with non-stick spray. Add pasta and chicken, then pour cheese sauce over and mix throughly until everything is coated. 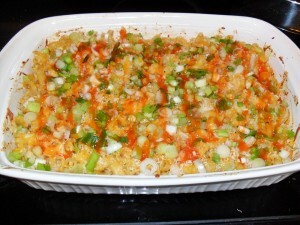 Sprinkle with additional grated cheese and bread crumbs. Bake for 25 minutes or until cheese is golden brown. Remove from oven and immediately top with Gorgonzola(or not) and green onions and drizzle with buffalo wing sauce. 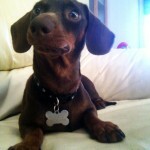 Today Templeton turns 3 years old! Or 21 in dog years. 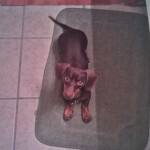 He’s been the best doggy and is super sweet. 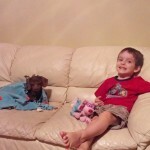 He lets Kaden do pretty much whatever he wants with him and pretends to enjoy it. 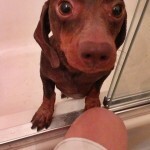 Or maybe he does enjoy it, who knows, he’s a strange little dog. 😛 And what do you get a dog for his third birthday? 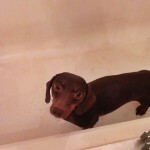 A bath! As pitiful as he looks in the pictures, he actually wanted a one. 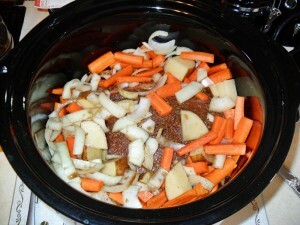 Yesterday I made roast beef and vegetables in the crock pot. It smelled sooo good all day long and I wanted to eat it so bad. But I had to wait until the husband got home from work. It was a lot spicier than I had planned on it being, but it was good. We both like some heat. When the Hubs finally got home, I dove right in. I was starving. So I forgot to take a picture of it when it was done. Mix all seasonings together in small bowl, and rub on all sides of pot roast. Put the vegetables around the roast and pour in the broth and Worcestershire sauce. I cooked it on high for a few hours and then turned it down to low for the rest of the time (about 2-3 more hours) because our crock pot super boils and burns everything. Tonight I made a new recipe: Butter Chicken. It sounded ok, so I thought I’d give it a try. I had no idea that it would be so delicious! The marinated chicken had such good flavor and combined with the rest of the flavors it was amazing. 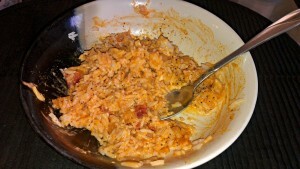 I made Basmati rice and poured in on top of the rice. The recipe made way more than the two of us needed, but it was so good I totally didn’t mind the leftovers. Combine the garlic, salt, pepper, spices and lime juice. Pour over chicken in a shallow container or Ziploc bag and marinate for at least two hours. Saute the onion in the butter until soft. Add marinated chicken and cook about 10 minutes. Add the tomato sauce and diced tomatoes. Cook for 30 minutes over medium-low heat with the lid on. Add the cream and cilantro and simmer for an additional 5 minutes, until sauce is thickened slightly. Serve over rice. 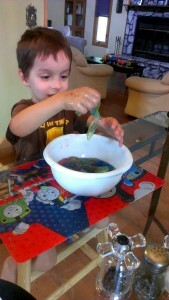 Today Kaden and I made slime! 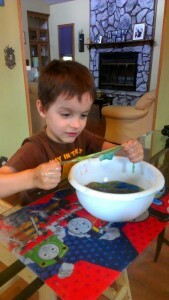 He was a little worried about what we were making at first, but in the end he had fun playing with it. We used 1 1/2 cups of clear Elmer’s glue and 1 1/2 cups of liquid starch. I used STA-FLO. 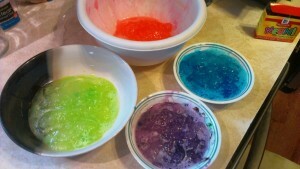 Mixed them together and separated it into four bowls and added a drop or two of food coloring to each. He ended up mixing it all together anyways, but it looked cool.